The U.S. Defense Department will establish a sixth branch of the armed forces, the U.S. Department of the Space Force, by 2020, Vice President Mike Pence announced. The Vice President of the United States, Mike Pence, announcing the establishment of the U.S. Space Force. “In his inaugural address to the nation, President Trump declared that the United States stands ‘at the birth of a new millennium, ready to unlock the mysteries of space,’” Pence said. 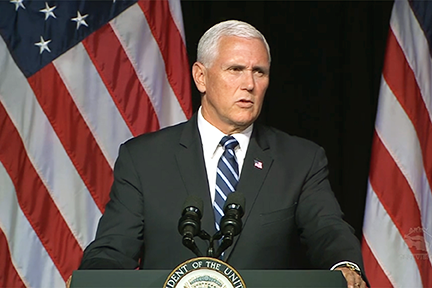 “To be clear: the Space Force will not be built from scratch, because the men and women who run and protect our nation’s space programs today are already the best in the world,” the vice president said. “Across this department and our intelligence agencies, there are literally tens of thousands of military personnel, civilians and contractors operating and supporting our space systems -- and together, they are the eyes and ears of America’s warfighters around the globe,” he added. A report to be released today represents a critical step toward establishing the Space Force, Pence said. It identifies several actions that DoD will take as the nation evolves its space capabilities, “and they are built on the lessons of the past,” Pence said. First, the report calls for the creation of the U.S. Space Command, a new unified combatant command for space. “This new command … will establish unified command and control for our Space Force operations, ensure integration across the military, and develop the space warfighting doctrine, tactics, techniques, and procedures of the future,” he said. Second, the report calls for the establishment of a Space Operations Force — an elite group of joint warfighters, specializing in the domain of space, who will form the backbone of the nation’s newest armed service. This force will draw from across the military to provide space expertise in times of crisis and conflict, Pence said. “Third, the report calls for a new joint organization — the Space Development Agency — that will ensure the men and women of the Space Force have the cutting-edge warfighting capabilities that they need and deserve,” he said. Ultimately, Congress must establish the new department, the vice president said. “Next February, in the president’s budget, we will call on the Congress to marshal the resources we need to stand up the Space Force, and before the end of next year, our administration will work with the congress to enact the statutory authority for the space force in the National Defense Authorization Act,” he said. Delve into the crucial business and financial side of the satellite and space market segments by attending Satellite Innovation — to learn more about the 120 industry leading speakers and their sessions as well as the all-important workshops, select this URL — satinnovation.com — to register.